Kristie O'Brien, Arizona State Senate Candidate, LD-17, challenging SB-1062 Sponsor Steve Yarbrough, issues statement upon U.S. Supreme Court ruling in Hobby Lobby. June 30, 2014 - Today's 5-4 U.S. Supreme Court decision in the Burwell v Hobby Lobby case reiterates the importance of my Arizona State Senate race right here in Legislative District 17. SB1062 Arizona's "religious freedom bill" that allowed businesses to discriminate based on a "strongly held religious belief" was sponsored by my opponent. The target of the discrimination was Arizona’s LGBT+ community. SB1062 will be back with a vengeance next legislative session. It is crucial Arizona voters make sure my opponent is not. Today's decision did not navigate the waters as to where a corporation's religious freedom exemption ends. In her dissent, Justice Ruth Bader Ginsburg asks, "Would the exemption . . . extend to employers with religiously grounded objections to blood transfusions (Jehovah's Witnesses); antidepressants (Scientologists); medications derived from pigs, including anesthesia, intravenous fluids, and pills coated with gelatin (certain Muslims, Jews, and Hindus; and vaccinations[?] . . . Not much help there for the lower courts bound by today's decision." The issue is now left to be determined in courtrooms and state legislatures across the country. Four years ago, people were outraged when the Supreme Court accepted the notion that corporations are people. Today, the Supreme Court accepted the notion that corporations are people with religious beliefs that trump the individual fundamental rights of their employees. This past weekend millions of Americans went to their respective houses of worship, not one corporation prayed alongside them. As a strong supporter of the First Amendment right to religious freedom, so too am I equally a strong supporter of Equal Protection of the Fourteenth Amendment and all other Constitutional Amendments extending protections of fundamental rights and freedoms. As a nation, we must find a way to solve a dispute between two fundamental rights. Today’s decision did not seek to resolve the issue, but only worked to create a slippery slope. Even with today’s ruling, I continue to stand in opposition to the poorly written and offensive SB1062. True change in Arizona policy can only take place with change in leadership. 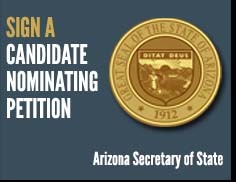 Arizona voters are urged to participate in this year’s elections. To learn more about Kristie O’Brien and her campaign, please contact Campaign@OBrienforAZSenate.com.